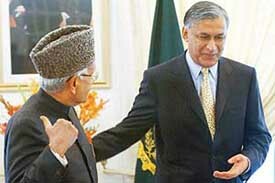 India and Pakistan today took a giant step forward in normalising bilateral relations when they agreed to start a bus service between Srinagar and Muzaffarabad from April 7, 2005, and commence new bus services between Amritsar and Lahore and to agreed religious places such as Nankana Sahib. Pakistani Prime Minister Shaukat Aziz (right) escorts Foreign Minister Natwar Singh at the Prime Minister’s house in Islamabad on Wednesday. Has the Nepal King acted wrongly in dismissing the government? While the common man here is faced with shortage of essential commodities due to recent blockades of Srinagar-Jammu National Highway, the Indo-Pak agreement on starting bus service to Muzaffarabad has brought cheer on many faces in Kashmir. Punjab and Haryana High Court Chief Justice Mr Justice B.K. Roy, who has been transferred to the Guwahati High Court and who left Chandigarh to take charge, continues to function as Chief Justice of the Punjab and Haryana High Court. To lodge their protest against the brutal killing of Abhi Verma, alias Harry, and the failure of the police to protect him, irate residents of the town observed a near total bandh today. The Kashmir valley remained cut off from rest of the country for the second day today as the Srinagar-Jammu highway was closed to traffic due to fresh snowfall at Jawahar Tunnel and landslides elsewhere, officials said. The ruling Samajwadi Party and the opposition for once joined hands in the Vidhan Sabha today to underline the role of MNC pharmaceutical companies in creating a hepatitis B scare to sell their exorbitantly priced vaccines. For Ashok Kumar, a local farmer, it is a second tragedy to come about in a year. 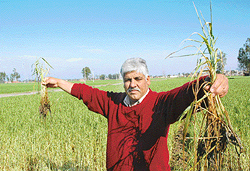 Earlier drought and now hailstorm have ravaged his dream to reap a rich harvest. Unable to describe his plight, Ashok Kumar, in a choked voice, says: “All has gone”. “All has gone,” says Ashok Kumar, a farmer of Khera Gajju village in Patiala district while standing in his hailstorm-devastated wheat field on Wednesday.